If you get a paper cut, you may wonder why such a small nick stings so much more than you might expect compared to a deeper wound, say, with a razor blade. Looking around the web for answers, there are several theories that get parrotted. So let's stay with a dermatologists's answer: Forget about the microscopic nature of the paper, its chemicals, or bacteria on it. Yet, beyond those discreditted ideas, dermatologists are still not sure. Before worrying about why, remember this first—seal the wound. Superficial cuts usually lack blood flow, so cover the wound with Vaseline or liquid bandage to do the job that scab formation would normally do. That also means the exposed raw nerves are no longer open to the air, and the pain signals are reduced. Pain originates from the nociceptors which are especially plentiful in the fingers where the sense of touch is most important. The word “nociceptor” compounds “receptor” with the Latin stem from “nocere”—meaning “harm”—indicating the survival purpose of nerves. Messages about sensing something hot, sharp or crushing are sent to the brain to produce a motor response to withdraw from the danger. The paper edge inflicts only superficial damage, affecting the most shallow nerves, which are the most sensitive, and respond with the feeling of stinging. Larger nerves, deeper in the flesh are the ones causing dull, aching pain. Also, under a microscope it is easy to see the paper edge is ragged compared to the metal edge of a razor blade. So the paper cut is more ripped than sliced, and more nerves are affected. Of all this information, the part to remember most is, when you get a paper cut—promptly seal the wound. 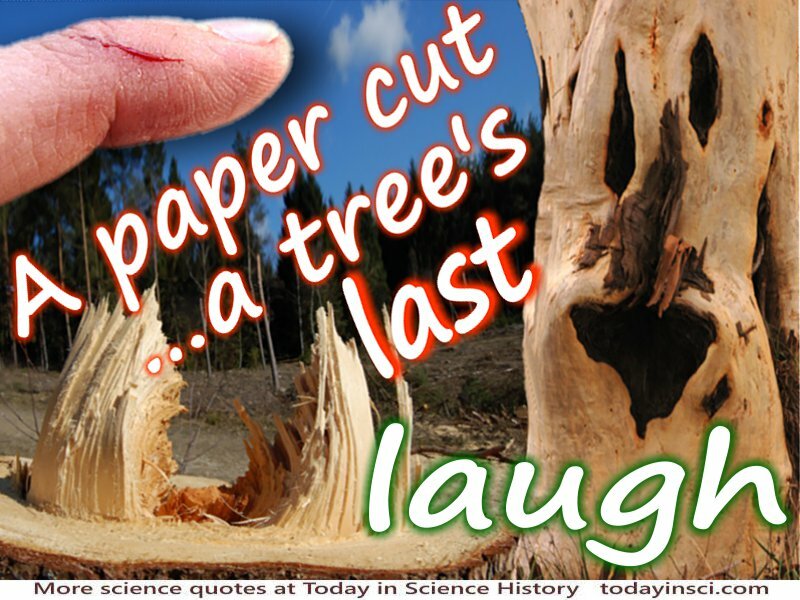 As for the tree's revenge, don't forget those sneeky splinters, too!